Connor is just getting to the age where he really is starting to appreciate bath toys. 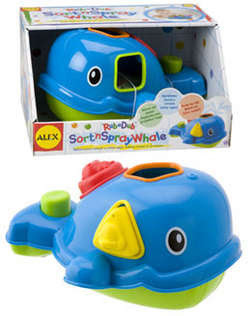 The Rub a Dub Sort ‘n Spray Whale, made by Alex Toys, has really done double duty for us as its as fun outside the bath tub as it is in! When this Toy came out of the shipping box Connor about had a fit for me to get it out for him.. he was instantly drawn to this little whales big eyes and the colors of the blocks (Connor is a block nut.. no joke). Though we are not quite skilled enough to put the blocks in the holes himself he LOVES to see me do it then get them back out. Ive been working with him to get him to hand me the colors when I ask as well. Inside the tub Connor is mesmerized by the blocks as if you turn them over they fill up with water and then the water drains out the other side in one or more streams. Then we practice pushing the green button which causes water to come out of the top of the whales head!! Connor usually gets overly excited once we start using the green button so we save that for the end of the bath. This toy is great for the budget minded parent who would love a toy that could do duel duty.. also GREAT for grandparents houses where you don't want fifty thousand toys as it could go from daytime play to bath time play with no problems. Its pretty darn cute too. You can get one of these great Alex Rub a Dub Sort ‘n Spray Whale at Amazon or in my Store! Oh, cool! Someone just gave us one of these at Christmas! Jacob LOVES it, though I think he's scattered the blocks in multiple rooms of the house...I still can't find one (he likes to cling to them as I take him out of the bath...).